Come on out, chickies! I spread a bale of straw over the snow so you will keep your princess feet warm! 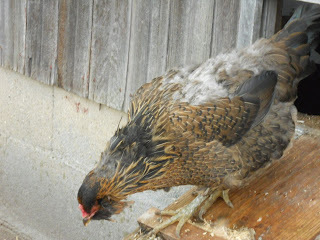 This Ameraucana looks awful, doesn't she? She's just finishing up her moult, but the reason her back looks like it is only down is that she loves to sit under the heat lamp. Araucanas (from which Ameraucanas descend) are a South American breed. I think she is a heat-loving princess. She'll sit under the heat lamp until her back starts to singe. Sometimes I come into the barn and she'll be under that red lamp with steam rising off of her -- at least, I think it's steam. Maybe it's smoke! Ari Duckass delights in a romp outside. 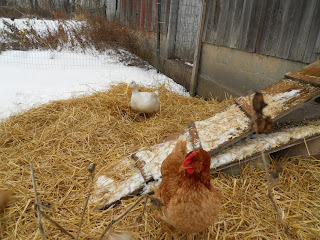 She ventures off the straw -- not so much the chicken princesses. 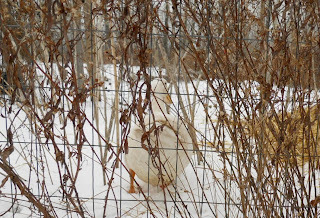 She buries her head under the straw, searching for little duck delicacies to gobble up. And all the while she narrates. When the feathers are all fluffed up, these chicken butts look nice and warm, don't they? 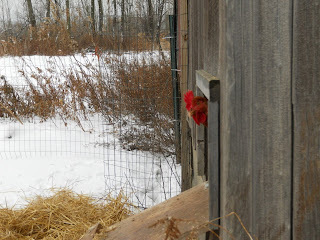 They only had a small area covered in straw, but for a while around ten of the birds came outside for fresh air. It was important to me that they had the opportunity today, because the forecast is for a foot of snow over the weekend, and more coming in the first week of 2010. And with temperatures dropping and winds picking up, they may not get out again for a while. I didn't tell them that. I didn't want to break their princess hearts. Your princess hens are very lucky indeed to have you taking care of them! That Ameraucana is a sun and sandel girl. 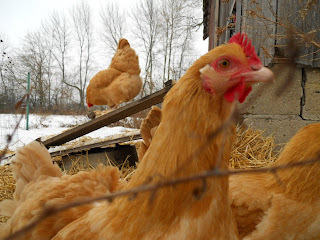 LOL My girls have to rough it out in the wet leaves, snow or stay inside their coop. 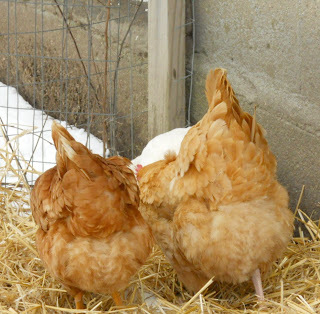 If it snows again I will toss some straw out for them and tell them about the princess chickens and how the straw on the snow is thanks to you. "... because the forecast is for a foot of snow over the weekend, and more coming in the first week of 2010. And with temperatures dropping and winds picking up, they may not get out again for a while. I didn't tell them that." Happy New Year to all at Busy Solitude Farm !!! Love your girls. The weather stinks this year in MS. Am ready for some warm days. Guest poster: Ulani - "Tis the Season"